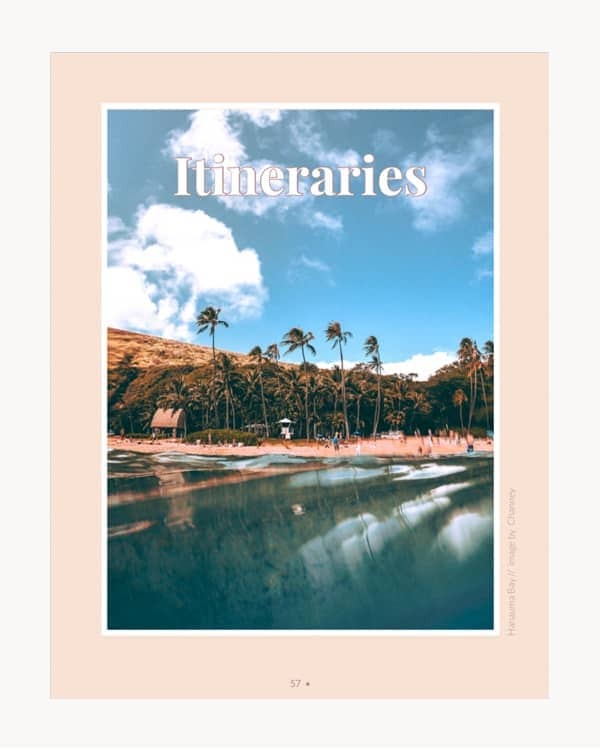 This Oahu Travel Guide is packed with 150+ insider recommendations on the best beaches, hikes, surf spots, restaurants, places to stay, and things to do on the beautiful island of Oahu. 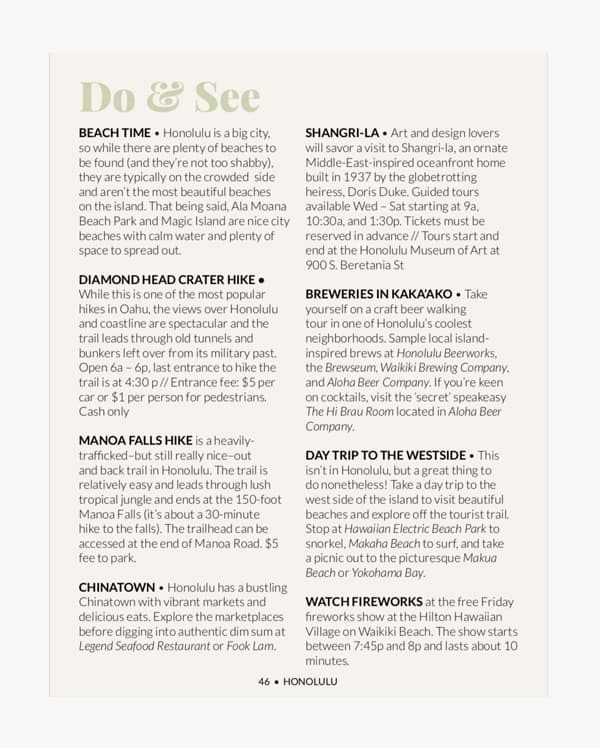 Packed with over 150 insider recommendations on Oahu, this travel guide will help you save time and make planning your trip fun and easy. Say goodbye to those hours of endless research and reading Trip Advisor reviews! With this ebook, you can stop the trip planning overwhelm. Just sit back, relax, and get all of the best information you need to have the perfect trip to Oahu. Oahu is one of the most popular vacation destinations in the world, and when you visit this island paradise you’ll quickly see why. The third largest Hawaiian island is home to stunning beaches, heaps of hikes, natural beauty galore, the bustling city of Honolulu, and famous world-class surf. From waterfalls, beaches, and waves, to nightlife, crafty eats, and shopping, there’s an overwhelming amount of things to do and see in Oahu! Your precious vacation time is limited so you want to figure out: When should you go? What should you do? How do you get around? In short, where do you begin? And more importantly, how do you figure out the best things to do and skip all the not-so-great things? Cue the hours of online research, top-ten lists, and 30 TripAdvisor tabs! That’s why we created this guide–to save you time, help you find the best stuff, and make planning your trip as easy as possible. I’ve been fortunate to have been going to Oahu since I was a kid (so around 26 years!) and I’ve spent so much time there I consider it my second home. It’s one of my favorite places on the planet and very near and dear to my heart. We receive so many questions about traveling in Oahu we decided to create this guide to help you have an amazing trip! When we travel we love to eat great food, find the best local spots, surf the best waves (for our styles), and explore the non-touristy side of destinations. We’ve written our guide with care to include everything we love to know when we travel to a new destination. This ebook cuts out the fluff found in other guidebooks and focuses on the good stuff: practical information, our personal recommendations, and how to make the most out of your trip. 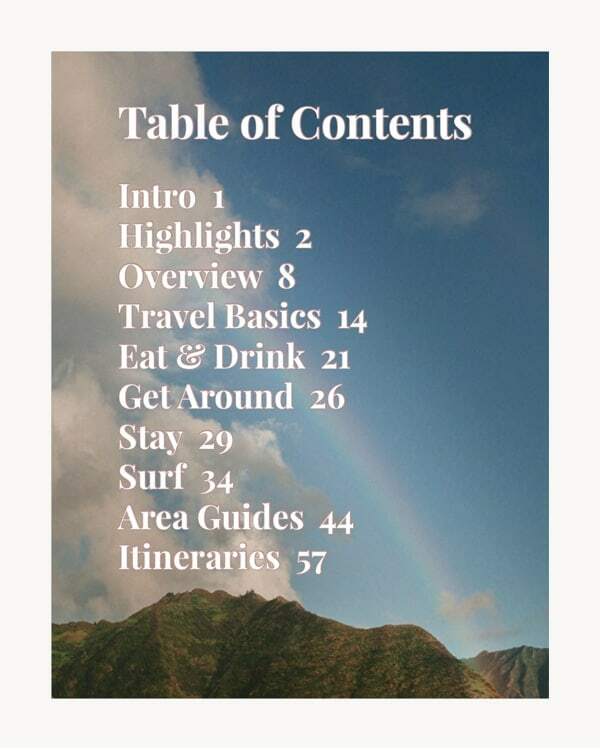 This Oahu Travel Guide covers everything you need to know for an awesome trip to Oahu. An overview of the different areas of the island, day itineraries, weather, when to go, travel costs, the surf, transportation, and the best places to stay, eat, shop, and play! If you’re a surfer, you’ll especially appreciate the ‘surf’ section, giving you an overview of the surf seasons and surf breaks on Oahu. If you don’t surf, no worries, you’ll still find the guide equally as valuable, and hey, Oahu is a great place to give surfing a whirl. 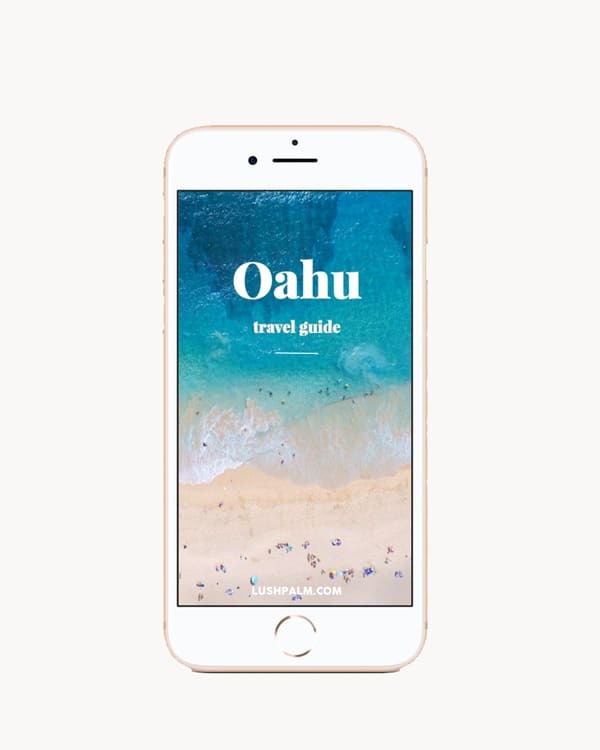 Our Oahu Travel Guide is a downloadable PDF guide that you can easily access on your phone, tablet, or computer at home and while you’re traveling. 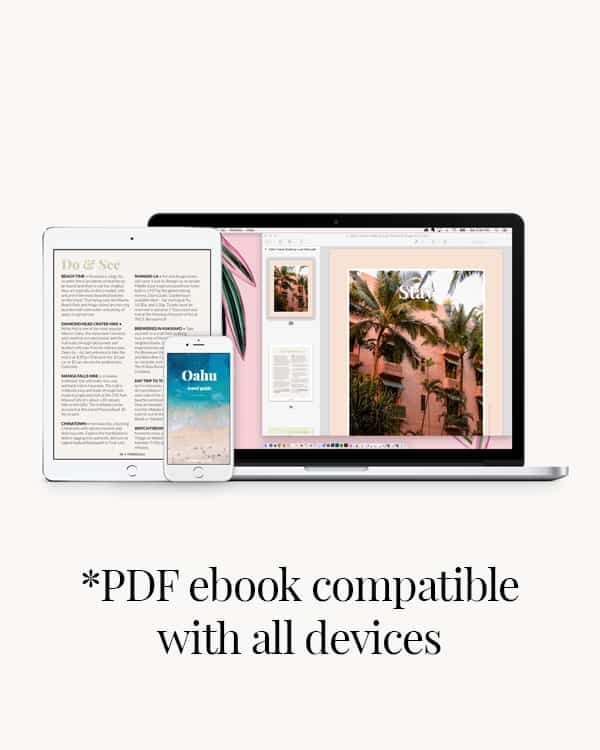 After you complete your order, you’ll receive immediate access to download the ebook, as well as an email with a download link for future reference. Oahu is a special place and we hope this guide helps you embrace the island magic and have an incredible trip! As always, please make an effort to travel consciously, respectfully, and help keep Oahu the paradise that it is. Happy travels and enjoy!